Orders will be shipped from Kyoto, Japan, by Bento&co. We ship worldwide! Shipping is free to most countries from $89 USD. You can contact us by email in English, French or Japanese at contact@bentoandco.com. With this box you can have your own little Cooking With Dog Bento show! The box itself is a two layered, with smart black silicon lids separating each compartment. The upper has a food divider inside so you can separate mains from sides. Delivered with a white elastic band to keep your nice meals safe on the go. Made in Japan by Hakoya, in exclusively for Bento & co! For more details and more bento products, shop on Bento&co! 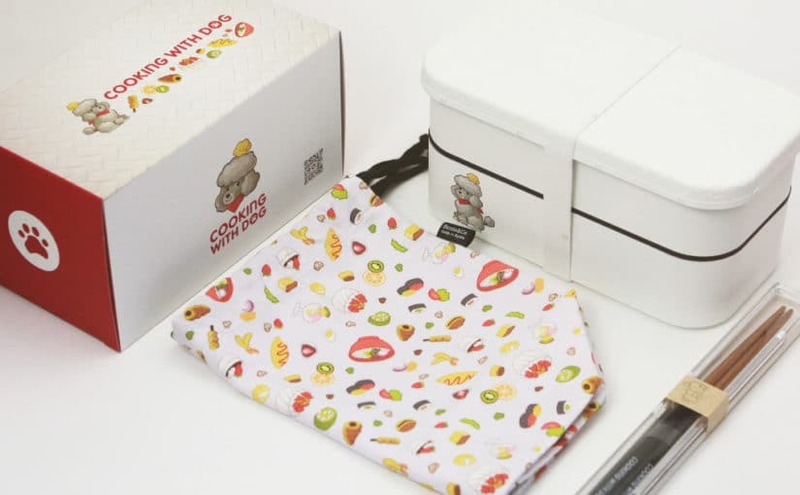 After you’ve made a delicious Bento meal following your favourite video and you want to bring it with you of course you’ll need a bag – Luckily we have partnered with Cooking with Dog and Hakoya to bring you this kawaii bag! As a bonus the bag is covered in all the delicious treats and dishes Cooking with Dog will teach you too make. Get Cooking! This bag will fit most of our S, M and L sized boxes. Pre-order now! This product will be shipped from Sept. 1st. Made in Japan by Hakoya, exclusively for Bento & co ! You’ve made yourself a delicious bento meal following the instructions on Cooking With Dog and now it’s time to eat! What you need is a pair of chopsticks up for the task – luckily we have partnered with Showa to bring you these exclusive chopsticks with Cooking With Dog branding! The chopsticks come in an elegant clear case with the logo printed on the very top – the best companion for your meals! Made in Japan by Showa, exclusively for Bento & co !